If an Escavalier you had in play was Knocked Out by damage from an opponent’s attack during his or her last turn, put all Energy attached to the Defending Pokémon into your opponent’s hand. Search your deck for 2 [G] Basic Pokémon and put them onto your Bench. Shuffle your deck afterward. Whenever you attach a Plasma Energy from your hand to this Pokémon, you may switch 1 of your opponent’s Benched Pokémon with his or her Active Pokémon. Move a [W] Energy from this Pokémon to 1 of your Benched Pokémon. As long as this Pokémon is your Active Pokémon, your opponent can’t attach any Special Energy cards from his or her hand to his or her Pokémon. Put 2 Item cards that have Fossil in their names from your discard pile into your hand. You may discard an Item card that has Fossil in its name from your hand. If you do, this attack does 50 more damage. Discard 2 [W] Energy attached to this Pokémon. This Pokémon’s attacks cost [C] less for each of your opponent’s Team Plasma Pokémon in play. They carry people and Pokémon, but the wind can catch them, so there can’t be a fixed destination. Move as many Special Energy attached to your opponent’s Pokémon to your opponent’s other Pokémon in any way you like. If this Pokémon’s remaining HP is 10, this attack does 70 more damage. Does 80 damage minus 20 damage for each [C] in the Defending Pokémon’s Retreat Cost. If the Defending Pokémon is a Team Plasma Pokémon, this attack does 40 more damage. When you play this Pokémon from your hand to evolve 1 of your Pokémon, you may discard all Pokémon Tool cards attached to your opponent’s Pokémon. For each Plasma Energy attached to this Pokémon, discard the top card of your opponent’s deck. Heal 20 damage from this Pokémon for each Plasma Energy attached to this Pokémon. Search your deck for a Supporter card named Iris, reveal it, and put it into your hand. Shuffle your deck afterward. Does 40 damage times the amount of [M] Energy attached to this Pokémon. It raises its offspring in its belly pouch. It lets the baby play only when it feels safe. During your next turn, each of this Pokémon’s attacks does 50 more damage (before applying Weakness and Resistance). 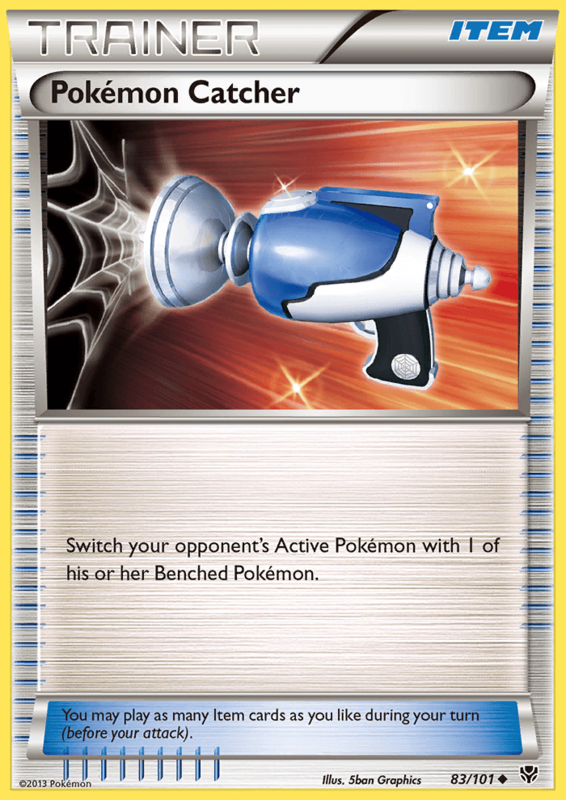 When the Team Plasma Pokémon this card is attached to is Knocked Out by damage from an opponent’s attack, search your deck for a card and put it into your hand. Shuffle your deck afterward. Look at the bottom 7 cards of your deck. You may reveal a Lileep you find there and put it onto your Bench. Shuffle the other cards back into your deck. The attacks of the Pokémon this card is attached to (excluding Pokémon-EX) do 30 more damage to Active Pokémon-EX (before applying Weakness and Resistance). Prevent all effects of attacks, including damage, done to the Pokémon this card is attached to (excluding Pokémon-EX) by your opponent’s Team Plasma Pokémon. Discard 2 Energy attached to this Pokémon. This attack’s damage isn’t affected by any effects on the Defending Pokémon. If this card is attached to Genesect-EX, that Pokémon may use this card’s attack instead of its own. Put 1 of your Pokémon and all cards attached to it into your hand. As often as you like during your turn (before your attack), you may move 1 damage counter from 1 of your opponent’s Pokémon to another of your opponent’s Pokémon.